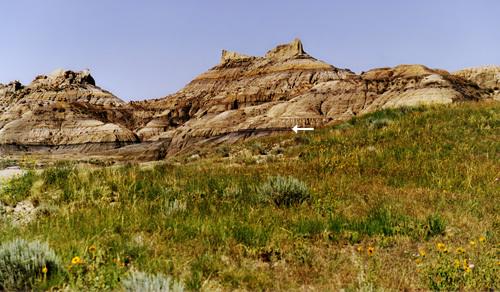 The dark band in this photo (indicated by the arrow) of the Hell Creek Formation in Montana is known as the z-coal, a coal layer that marks the approximate boundary between Cretaceous (below) and Tertiary (above) age rocks. Mesozoic means "middle animals," and is the time during which the world fauna changed drastically from that which had been seen in the Paleozoic. Dinosaurs, which are perhaps the most popular organisms of the Mesozoic, evolved in the Triassic, but were not very diverse until the Jurassic. Except for birds, dinosaurs became extinct at the end of the Cretaceous. Some of the last dinosaurs to have lived are found in the late Cretaceous deposits of Montana in the United States. Clayton Lake, New Mexico: This Cretaceous site has some of the most extensive and best preserved dinosaur trackways in the United States. Ischigualasto, Argentina: The best-known and best-preserved early dinosaurs come from this Triassic locality in South America. Pt. Loma Formation, California: This Cretaceous locality has yielded important fossils for understanding western North American dinosaurs. See UCMP's Dinobuzz and explore some of the frequently asked questions about the biology of dinosaurs. Were they warm-blooded? Why did they go extinct? Are dinosaurs related to birds or are they reptiles? Find out more about the Mesozoic paleontology and geology of North America at the Paleontology Portal's pages on theTriassic , Jurassic, and Cretaceous Periods. See the Wikipedia page on the Mesozoic.